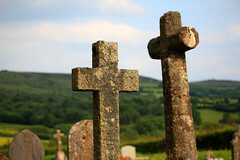 Church graveyard near Glasbury, Wales. Death is a fascinating subject. It's the one thing we all have to deal with at some point, so it's one of the very few truly common human experiences. Yet occurring where it does, it's also the one thing we can never be certain about, in timing, circumstance, or what it will be like to experience first-hand. Defining death, like so many things, is not as easy as it first appears. Our body has numerous systems which can shut down at different times. Generally these all do within a few minutes of one another. But there is that space in between, when a person's heart may stop beating and their lungs stop breathing, but neural activity in the brain is still ticking over. So some of these people can be revived. Then there are the opposite cases, where brain activity has ceased, but the circulatory and oxygenation systems that keep the muscles and other organs alive are still working. These twilight cases can lead to difficult decisions by people around the subject, moreso with modern medicine. In the past, things seemed simpler. There was something vital in the body, that made it move around and talk and behave like a person we knew. At some point that vital spirit departed and the body began to decay, like so much rotting meat. It's no wonder that people wondered where that vital spark of life went. What happened to the person we knew, after they left their body behind? So to make some sort of sense of the process and to ease the pain of mourning, human cultures throughout the world developed stories about death, and what happened afterwards. Death wasn't the end of our existence, it was a transition to some sort of afterlife, or to returning in some other body somewhere. We anthropomorphised Death, and came up with gods who looked after the dead. We also developed rituals and traditions surrounding death. The proper way to treat a body, whether that be burial, immolation, mummification, being left for animals to devour, or being devoured by fellow humans. The proper words or prayers to be said. The gatherings of friends and relatives. 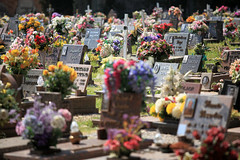 Sometimes the gatherings are sombre affairs, sometimes they are raucous celebrations of the life of the departed. Death is not something we like to think about. But it is so common to our experiences that reminders are everywhere. The skull and crossbones is used as a symbol for danger; it is really a symbol designed to remind us that what is labelled is potentially deadly. 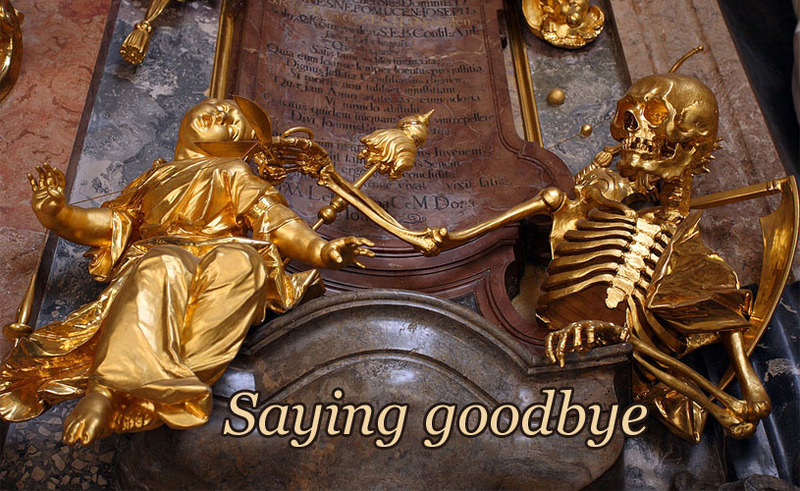 There is death iconography in our entertainment, in our marketing, and in our social lives. Places of worship are rife with it - understandably so since one of the functions of religion is to provide comfort to people in the face of death. We collect the remains of our dead and store them in cemeteries. We build memorials to them. You cannot escape reminders of death. But my own experiences with death have been very limited. I didn't know death at all until after the end of my bachelor's degree at university. I was about 23 years old, and in all that time, not a single member of my extended family, not a single friend, not a single acquaintance, had ever died. At least that I knew of. It's possible, for example, that my kindergarten teacher had died, but not having heard anything about her for 18 years, I was unaware of it. As far as I knew, nobody that I'd ever met in my entire life had died. I remember exactly where I was when that changed. I was outside a friend's house, on my way in for a party, and bumped into a friend arriving at the same time. He said, "did you hear? David X died, in a car accident." My immediate reaction was shock: "What? Really??" David X was more an acquaintance than a friend. He was an ex-boyfriend of a woman I was friends with at university. I didn't hear much else about David X, and did not attend his funeral. Within a couple of years, the same woman's next ex-boyfriend died. Dan was a guy I knew fairly well from Internet interactions, and whom I'd met briefly in person. He was a keen skydiver, among other things. Unfortunately, something went wrong with his chutes. My reaction when I heard of this was much more horror than shock. I know skydiving is an activity safe enough that thousands of people do it regularly without a problem. But accidents do happen, and when they do the results are horrific. Now this is an odd thing about death. It's emotionally charged and the way we think about it is hard to change with dry facts and statistics. A car accident is horrible and many more people die from them than die skydiving. Of course many more people drive around than skydive, so you need to normalise the statistics somehow. And it depends how you carry out the calculation and where you get your baseline stats from, but one estimate is that driving 10,000 miles carries the same risk of death as making 17 parachute jumps. Dividing by 17, one parachute jump is about as risky as driving 590 miles, or 940 kilometres. I've driven 940 kilometres in a single weekend. We don't think of that as being a huge risk of dying. In a very real sense, I'm very unusual in knowing somebody who died while skydiving, yet all too common in knowing someone who died in a car accident. And even though I know the stats, and understand the logic, I happily get into a car every week, yet I'm not sure I could bring myself to jump out of a plane. Then there's the other weird connection you may have noticed by now. This friend of mine - both of her first two boyfriends had died before she was 23 years old. At the same time as being struck by the tragedy of this, I could not help being reminded of the character of Maggie O'Connell from the TV show Northern Exposure. The writers had given her this odd back-story: that every one of her former boyfriends had been killed by bizarre accidents. It's the sort of thing you only see in fiction, right? Well, two odd events is enough to make a pattern in our human minds, and bring to mind all sorts of odd ideas that can't really be true. It's so incredibly easy, even as a scientist trained to think rationally, to slip into fanciful "explanations" for odd events that are mere happenstance or coincidence. Fortunately, there was of course no such curse in real life, and my friend is now happily married with three kids. To transport me and my new wife to the reception, we chose not to hire a car, but rather to ask my grandfather to drive us in his beautiful old white Mercedes. He'd owned a white Mercedes for as long as I could remember, and while not quite "vintage", it was getting there. He was flattered and delighted to be asked. I was his first grandchild to get married (of nine, five of us by then of marriageable age). So after the ceremony and photos, he drove us towards Manly. As it turned out, not only was the Friday evening commute heavy, there was a multiple fatality accident on the bridge I mentioned. We ended up stuck in traffic, about three kilometres back from the bridge, not moving, for well over an hour. This was back when mobile phones were a rarity. None of us in the car had one, so we had no way of contacting anyone else involved in the wedding. People stuck in the traffic all around us gave us cheerful waves. At some point people started getting out of their cars and dashing across to the nearby petrol station to buy snacks. Someone walked along the bus stuck beside us, holding out a big bag of potato chips for people in the bus to reach out the windows and grab a handful of. Stuck in the car in our wedding clothes, we had nothing to do but have a long conversation with my grandfather. None of our wedding guests arrived at the reception until almost two hours after the event was due to begin. The staff there wondered if the wedding had been cancelled dramatically at the last minute. But we showed up eventually, and negotiated an extension to allow the party to extend later into the night. It was a happy day for us, but I can't ever forget that several people lost their lives in a terrible traffic accident that evening. Within a year, my grandfather succumbed to various age-related illnesses. He was the first member of my family to die in my entire lifetime. His was the first funeral I would ever be attending. Only we never made it. My new wife and I left our place with plenty of time to make it to the funeral venue. On this occasion, I never found out what caused the traffic to be so bad, but we were still sitting in it by the time the service was due to start, and by the time it had ended. We changed course and headed instead to my grandparents' place for the post-funeral gathering, which we finally arrived at well after everybody else. Bad traffic stole from me the chance to say goodbye to my grandfather. But bad traffic, caused by the deaths of people I'll never know, also granted me a last long conversation with him, and the chance for my new wife to have the same. We build monuments to those we have lost. 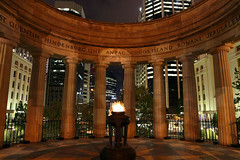 Memorials to those fallen in war. Personal remembrances to those near to us. And we can see those built by others. 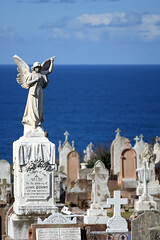 Cemeteries and graveyards hold a strange fascination. They are peaceful, sombre, but also beautiful. As time passes, the people who remember the dead age and pass into death themselves. But the memorials remain. Slowly, they decay, become overgrown. Sharp chiseled names and features are worn smooth. Lichen and moss cover gravestones - life slowly regaining a foothold in the aftermath of death. Isola di San Michele, Venice. Cemeteries are fascinating places to visit, even if you know nobody interred or memorialised there. There's a feeling of peace you don't get in many other places in our modern world. There is beauty, and ugliness. Newness, and decay. 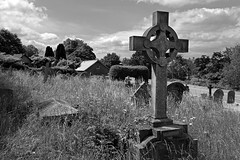 Graveyards are one of the places I love to photograph. There are stories there. Stories which I will never know, whose barest minimum of information I will ever be able to glean from the sparse inscriptions written on the stones. Each one has a story behind it. But all I can do is look, and admire, and hope that they are good stories, and that these people were loved in life. I make photographs of the stones, the sculpted angels, the colonising weeds, the fresh flowers. Some of these images are too beautiful to hide from the eyes of the living. On my recent trip to Venice, I took the time to make a trip to Isola di San Michele, Venice's cemetery. 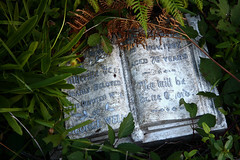 I expected many old graves, some partly decayed, that would make interesting photographic subjects. But the Venetians keep their cemetery neat and tidy, and in fact the island hasn't been used as a cemetery for all that long (there are older cemeteries here in Sydney where I live). Most of the graves were fairly recent, within the last 20 or 30 years. And covered with colourful flowers. Not the dull grey-green place I'd been expecting at all. 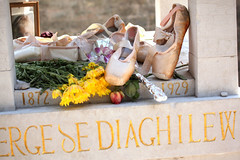 Grave of Sergei Diaghilev. Isola di San Michele, Venice. My wife and I wandered around. We found the grave of composer Igor Stravinsky, probably the most famous person interred there. Nearby was another grave, the name on it Sergei Diaghilev. I had no idea who this was at the time, but I could tell he probably had something to do with ballet. For lain on his stone were several pairs of pointe shoes, some obviously having been there exposed to the elements for several weeks, one pair brand new and spotless pink. There were also handwritten notes in various languages pinned under small stones. Looking up his name later, I discovered Diaghilev was the founder of the Russian Ballet, and a legend in the ballet world. I've seen several graves of famous people, but this was the first one I'd seen with such obviously emotional tributes left by people who never knew the person, but whose lives had been affected by them. I didn't see a dancer there, but I could imagine them arriving, finding the grave, and sharing an emotional moment in time with the memorial as they left their tribute. Continuing around the cemetery, I came across an area with many small cherubs carved atop the gravestones. 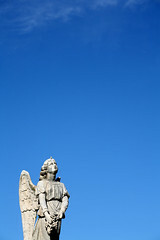 Since angels and cherubs are a favourite photographic subject for me, I went closer. Before photographing, I glanced at the inscriptions on some of the stones. My stomach turned as I discovered this area of the cemetery was dedicated to children who had lost their lives without a chance to grow to adulthood. Babies, toddlers, infants, young children. The birth dates and the death dates on the stones were unsettlingly, depressingly close together. It hit me like a hammer. No matter how little death we have seen in our lives, it can still feel like too much at times. A few years after my grandfather, my grandmother joined him in death. Hers was the first funeral I ever attended. I had no idea what to expect, in terms of the ceremony itself, or what my own emotional reaction would be. We all loved her, of course. She'd had a good life, raising five kids and nine grandkids. She never got to see her first great-grandchild, born to one of my cousins a few years later. It was a sad occasion, but not overwhelming. Recently, I attended just the second funeral I've ever been to. The partner of a friend of mine had cancer. When I last saw her, it was in remission, but that was over a year ago. It came back. I hadn't been in touch with this friend for a while, and his e-mail came as a shock. Of all the people I've known who have died (and you now know about all of them), this one has easily affected me the most. She was young and vibrant and a perfect partner for my friend. I didn't know her very well, but I have known her a long time - since around the time I met my wife. I would have gone for a civil ceremony, but my wife is Catholic, and wanted a church wedding. I figured I had nothing to lose by acceding to this request. For several years my entire extended family consisted of just two generations: mine and my mother's. It was the fifth-oldest cousin who finally had the first member of the next generation. Last Modified: Saturday, 4 January 2014; 13:48:48 PST.